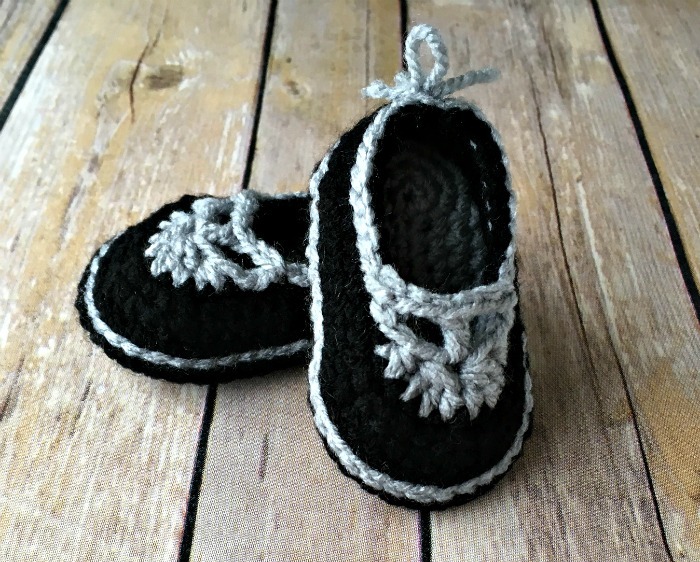 Sweet Sophisticated Mary Janes - Free Crochet Pattern - love. life. yarn. Interested in becoming a published crochet designer? Check here for tips and tricks! Ever since I designed my first pair of baby booties for publication I have not been able to get enough of them. First I created a pair of Basic Baby Booties and now I am working on several more designs. I used Lion Brand 24/7 Cotton for my first pair but decided to try a different yarn for this design. I had two skeins of Red Heart Baby Hugs Light left over from another project I did with these yarns and thought it would be perfect for these shoes – I was right! These turned out even more adorable (in my opinion). I keep thinking I’m going to create more baby boy items, though, and they always seem to take a turn towards more feminine. Like these – after I was almost done I decided they needed something and created the T-straps, giving them a Mary Jane feel. Maybe I’ll get around to creating a boy design soon (if you don’t know me I have no girls – three boys, the youngest of which is a toddler!). I hope you enjoy this pattern! Be sure to check out the Sweetheart Baby Shoes, too! Shown in size 0-6 months. Notes: Rounds are not joined unless noted. Place stitch marker in first st of each round to keep track. If only one number is given that number applies to both sizes. Row 1: 3 sc in 2nd ch from hook, sc 3 (4), hdc 2, dc 2 (3), 7 dc in last ch. Working on opposite side of ch, dc 2 (3), hdc 2, sc 3 (4) – 24 (28) sts. Row 2: Work 2 sc in each of next 3 sts, sc 8,(10) 2 sc in each of next 5 sts, sc 8 (10) – 32 (36) sts. Row 3: *Sc 1, 2 sc in next st; repeat from * two more times, sc 8 (10), repeat from * five times, sc 8 (10) – 40 (44) sts. Row 4: *Sc 2, 2 sc in next st; repeat from * two more times, sc to end – 43 (47) sts. Make an invisible join. Weave in ends. Holding 2 soles together (one of each color) with RS facing out and CC on top, join MC in any stitch, going through both soles. Sl st around edge to join soles. Make invisible join. Weave in ends. With MC, join yarn at center heel st. Round 1: Ch 1, sc in each slip st; join to first sc with slip st – 43 (47) sts. Round 2: Ch 1, sc 13 (15), *sc2, sc2tog; repeat from * three more times, sc 14 (16); join to first sc with slip st – 39 (43) sts. Round 3: Ch 1, sc, sc2tog, sc 11 (13), *sc, sc2tog; repeat from * three more times, sc 10 (12), sc2tog, sc; join to first sc with slip st – 33 (37) sts. Round 4: Join CC, slip st 11 (13), hdc2tog, dc3tog 2 times, hdc2tog, slip st to end. Make invisible join. Weave in ends of MC. Draw ends of CC to back of shoe and tie in tiny bow. Cut off excess. With CC, join yarn in second slip st to right of first hdc2tog (see photo). Row 1: Ch 2, dc in second dc3tog (this stitch should appear to be in the very center of the shoe), ch 2, join with slip st in 2nd slip st to the left of last hdc2tog. I have really been enjoying creating baby bootie patterns and hope you’ve enjoyed this one. 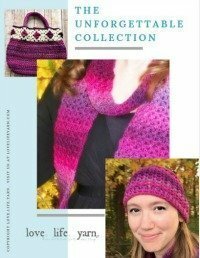 Don’t forget to check out my library of free crochet patterns, too! 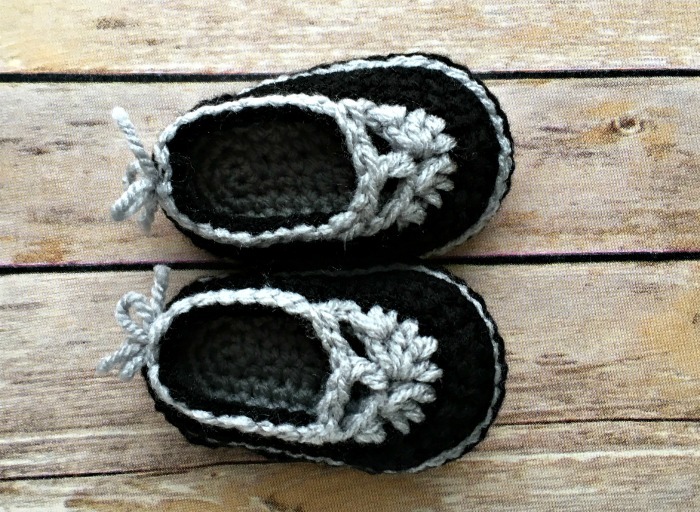 Very precious booties, can’t wait to make them. ? Thank you for the pattern – these are adorable!!!! You are so welcome!! 🙂 Glad you like them! Love these, thanks for sharing. What caught my eye on these is the T strap you added makes it look like an owl face which is very popular these days. So maybe you should add the word “owl” to this page so it will come up in more searches. Much respect, God bless. I am having trouble with my stitch count, when you start the body with ch1 do you sc in the same st as the ch1 and for all other rounds or never sc in the ch1 for all rounds?? Hi Natalie! I did not sc in the first stitch with the ch-1. Does this help out the stitch count? Yes ! Thank you, i realised my mistake, i was also including the slip st as a st….i think i’ve got it now ? The shoes are adorable ?? Yay! Glad it is working out. The slip st throws a lot of people off – sometimes it still gets me, too! Hello! Super cute Mary Janes. I currently making them and I have a question. The MC is used to join the two soles together, correct? So why is it finished off after the slip stitches when the MC is then used to do the body? And as the body is being worked, will the RS be inside the shoe? Thanks! I tried not cutting the yarn since you use the MC right after but I couldn’t do the Invisible Join without cutting it. When you work the rounds of the body of the shoe the right side is facing out. Let me know if you have any other questions! ? Do you have a pattern for adult slippers? 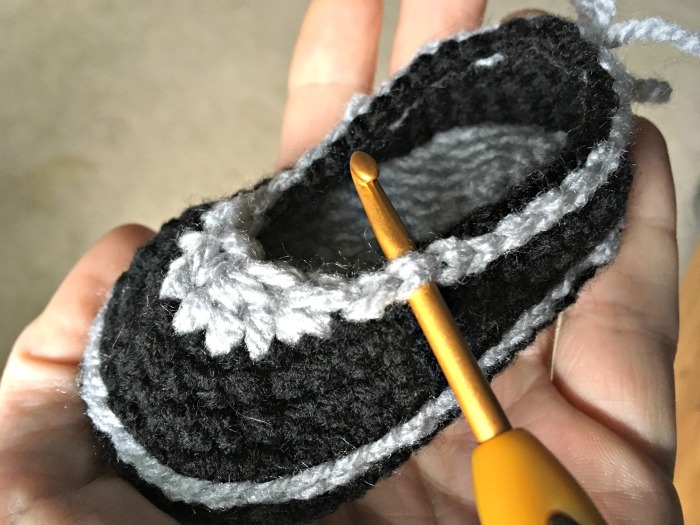 My sister is going through chemo and radiation and her feet hurt a lot I am making her slippers and would love to make these for her, she had a small foot but not a baby size . I haven’t made any adult slippers yet. There are lots of cute patterns out there – you can check ravelry or pinterest for some cute adult patterns. Here is a great round up of free patterns, too – check it out at Whistle & Ivy. Do you have an adult pattern? My sister is going through chemo and radiation at the same time and her feet hurt a lot. I would love to make these adorable slippers for her. Hi Keke – I don’t make things to order but I do have the original pair seen in these photos. If you are really interested, send me an email via the “contact me” link.